You can get out of tourists views if you just keep hiking past the regular trail for the savage loop. But it will take a long while. If you don’t want to travel far into the National Park and you don’t mind hanging around more people than this is the place to camp. It’s not part of the National Park so camping is allowed. You follow a tiny little path down off the side of the road and can set up camp at the bottom of the rocks. The waterfall is beautiful and it offers wonderful views of the Nenana River. This area is one of my favorites. The views are admittedly not that great when you aren’t actually on the glacier, but it’s such a great little inlet to be in and with multiple water sources. Hiking to beautiful views is very easy from all the camp spots. Getting to the camp spots on the other hand is more difficult! You have to cross so many rivers just to get to the start of the glacier area. Expect to be hiking 3-4 hours just to get to the front of the inlet area. There is a bear den den in this area so be careful. They ran right in front of me as we were leaving this last time I went. Know what to do with bears and do not follow them, it is their territory after all. Unit 34 is another backcountry site in Denali National Park. It is plagued by marsh and thousands of mosquitos, but if you have mosquito gear and get up the mountain as quickly as possible you should be fine. You only have to hike a mile or two to get out of site of the park road. You will need to hike more to get out of the mosquitos and near a water source though. 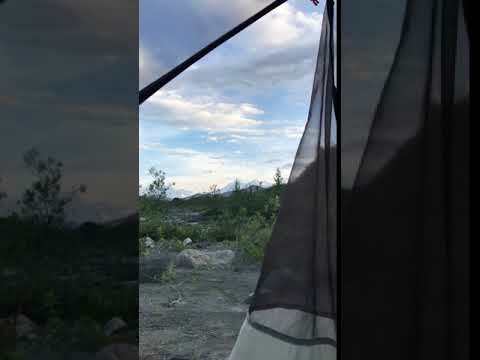 The mountains nearby make a perfect camping spot as you can climb your way out of mosquito hangouts and into the beautiful view of the mountain. Backpacking in Denali National Park and Preserve in the wintertime is rough. Do not try it unless you know what you are doing. Everything in the area pretty much shuts down during the winter months! Do not expect a warm Irish coffee after the backpacking trek through the snow. On the plus side, everything is free! If you can get yourself out there you can go as far as you would like. I only got 1-2 miles from the sled dog kennels as my toes thought it was too cold to venture further. There are limited water supply areas and if you do want them you must be willing to trek a few miles in deep snow to get to them. I should mention that there’s lots of snow during the wintertime just one more time. Be prepared! i visited in October but for some reason can not change it to the proper month. BUT you also get the chance to see the northern lights so it’s a win. P.s. these units are very very different during the summer months and very accessible to tourists! When choosing which unit you want to backcountry camp in, I would recommend choosing one of the units near the Muldrow glacier. 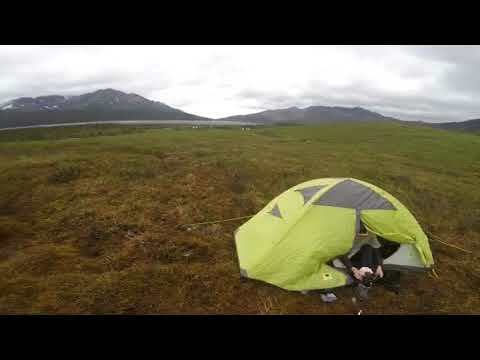 On just the other side of the Eielson visitor center you will find vast tundra, rivers, glacial lakes, and glaciers. I saw a herd of 30 caribou here just grazing and getting in the way of my path. If you don’t want to hike too far then maybe choose a different unit as you have to hike quite a few miles before being outside of view from the park road. Mid it’s a nice day outside and the mountain is out you also get the chance to see the great Denali in all it’s glory above Muldrow glacier. If it’s not out, then no worries because the unit is just as awesome without it! Also if you are running low on water tablets there is fresh water at the Eielson visitor center. Do not rely on it as it is still at the park road and no where near your camping area. This was one of my favorite units and I have heard similar reviews from other backpackers. 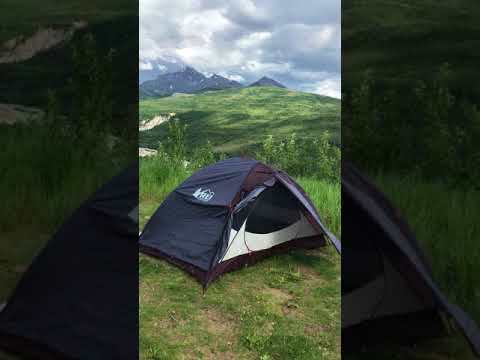 Denali National Park and Preserve allows for backcountry camping. With that comes extreme risks as it is one of the most remote places that you can be. The National Park service does a wonderful job making sure that only a certain amount of people are allowed in each unit within the park. In this particular unit (north side of the Toklat river into the polychrome mountains) I saw the most wildlife I have ever seen while out backpacking. We found an animal spine, saw a moose, got turned around by 3 bears chilling in our potential camp location, and then at the end of the trip also saw 2 more grizzlies less than 30 feet away. Note; do not go here looking for bears, they are dangerous creatures and should not be harassed/seeked out in the wild. If you do not trust your river crossing skills to the highest level, do NOT cross the rivers. My friend and I got stuck on the other side of the river with those aforementioned grizzly bears and had to camp an extra night in order to be able to cross the rivers as the water levels had risen. Backcountry adventures are inherently risky. Do not try them unless you are prepared. Bring bear spray, leave no trace, and ultimately experience the vast beauty that is Denali National Park. There are multiple little land masses throughout Otto Lake that you can kayak/boat to and camp. There is one small one in particular that doesn’t take too much effort to get to. There is a fire pit built in the center but make sure no one is out here before officially setting up for the night! Many locals like to go there for the day and just hammock or rest after kayaking. The price will be dependent on if you have kayaks or boats to get to the island. The lake is not deep and you could probably walk across to the little land patch if necessary. There are no restrooms and please please clean up after yourselves and others! This is an area that locals like to keep somewhat a secret. A beautiful overlook point that you can be camping right across from Mt. Healy with wonderful views of Sugarloaf mountain. The road is a bit patchy so rental cars or delicate cars probably shouldn’t be taken out there. Just a makeshift fire pit and a spectacular view out there but it is worth it. This particular spot is right next to one of the roads to other local campgrounds so be prepared for other cars to drive by occasionally. Because it’s a local spot we must ensure it is kept clean! 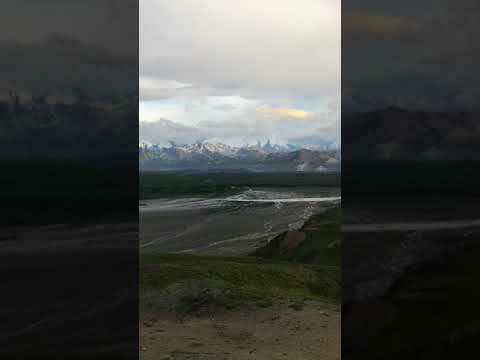 This site is probably the easiest campground to get to and will have the most access to the Denali area. If you want to camp but still want to be able to go get some brews at 49th state brewing then this is the place to be. There is also showers, bathrooms, and a little store at the campground site. 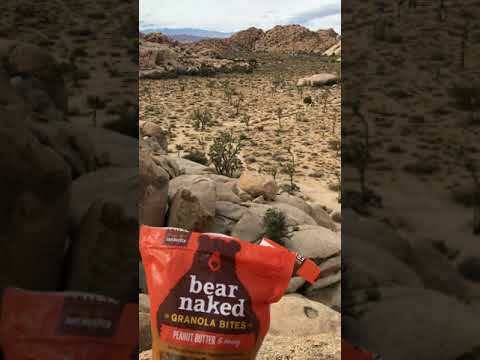 This is a great stopping point for before or after a backpacking trip into the backcountry in the Park.